As travel becomes more accessible, more and more people are choosing to head off the beaten path. It can be a lot of fun to visit the main touristic cities and countries of the world, but it's also highly thrilling and exciting to do something different and head off to somewhere new in search of new experiences, emotions, encounters, and memories. One of the top areas for many people looking to head away from the classic tourist traps and see purer places with a lot of beautiful, pristine scenery and unique cultures is Central America. Costa Rica is a great example. This country, which is home to around 5 million people and has borders with Nicaragua, Panama, and Ecuador, can boast two stretches of coastline - one along the Pacific Ocean and one along the Caribbean Sea - along with some outstanding natural areas and national parks like Corcovado National Park, the Monteverde Cloud Forest Reserve, and the Manuel Antonio National Park. Costa Rica is also home to some thriving big city locations like San José. The capital city of Costa Rica, San José is a great spot to learn more about the country and soak up some of the Costa Rican culture by visiting places like La Sabana Metro Park, the National Theater, and the National Museum of Costa Rica. No matter where you happen to be traveling in Costa Rica, it's a beautiful country to see and explore, and it's becoming a very popular spot with backpackers and young travelers hoping to stretch their budgets and see as much as possible. If you're traveling on a light budget or just want to keep your costs low and stay in some simple accommodation with clean rooms and useful amenities, a Costa Rica hostel could be just what you need. Hostels in Costa Rica tend to be quite highly rated due to the fact that the country is visited by so many backpackers, so you'll find friendly people, comfortable rooms, and good quality facilities at each hostel you visit. Read on to learn all about a few of the best hostels in Costa Rica. Located right in the center of Downtown San José, the Costa Rica Backpackers Hostel is one of the best rated hostels in the country of Costa Rica and is also one of the most affordable. Stays at this location are really cheap, but the accommodation itself is surprisingly comfortable and nicely laid-out, with some good on-site features and amenities like a swimming pool, a bar, a restaurant, and a communal kitchen. This Costa Rica hostel is only minutes away from the National Museum of Costa Rica, so it's a great place to stay for people wishing to explore the city of San José and learn a little more about the city and the history of the country. It's within walking distance of the National Theater as well, with a train station less than 10-minutes away and plenty of good parks, restaurants, and more in the local area. Located in Escazu, which is quite a trendy and fashionable suburb of San José, the Fauna Luxury Hostel really lives up to its name by offering luxury living and stylish accommodation for all guests, despite being a very affordable, low-cost hostel. So, if you happen to be visiting Costa Rica on a budget but still want to feel like royalty during your trip, this is a good hostel to choose. The hostel features capsule beds and spacious dorms with nice big windows and balconies too. 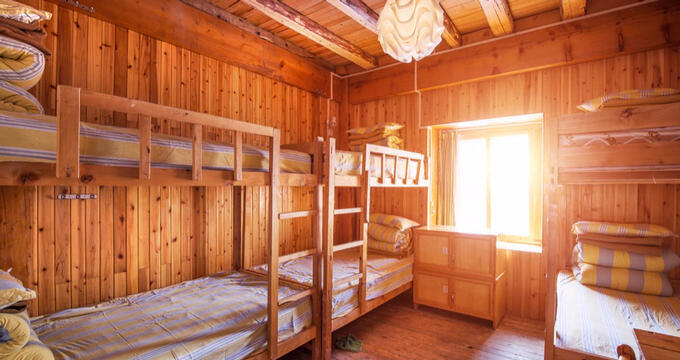 The shared bathrooms are beautifully decorated and the hostel also features an outdoor pool, a dining area, a bar, a hot tub, laundry machines, and free yoga sessions each week. It's about 20-minutes from the main San José airport and a relatively short journey away from the Downtown areas too. If you're heading down to Costa Rica to spend some time exploring the country's gorgeous coastal areas, the Cool Vibes Beach Hostel could be the best place for you to stay. One of the top rated hostels in Costa Rica, this location is situated in Dominical, literally a couple of minutes away from the beach, so it's perfect for people who want to spend their time sunbathing and relaxing on the soft sands of the Costa Rican shores. This nicely laid-out hostel has been lovingly decorated with a lot of eye-catching furniture and bright colors to create a warm, homely feel for all guests. Outside, you'll find a patio area with hammocks, comfortable chairs, and even a hot tub for hanging out with your friends. Inside, you'll see a nice TV lounge area, some comfortable rooms, and a laundry area with washers and dryers too.